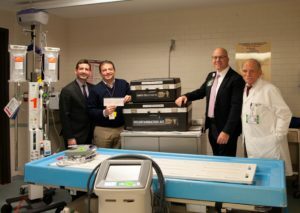 On Thursday, January 17, representative from Entergy delivered a $30,000 contribution to Phelps Hospital. Phelps Hospital and Entergy have had a long and effective partnership. Phelps staff have been trained by experts from Entergy on radiological accident preparedness. Once a year, Phelps conducts a decontamination drill utilizing their state-of-the-art decontamination center. Although Phelps is one of several hospitals that can assist in an emergency, they are the closest hospital to Indian Point that sits just outside the emergency planning zone should there be a radiological mishap there.